The new law, submitted for consideration in the legislative assembly of New York, requires manufacturers to make cleaning agents, in particular, capsules for washing, more safe for children. Capsules should have a non-attention-getting “neutral color” and a hard shell that could not be gnawed, according to the sponsors of the bill – the democrats Brad Heulman and Aravella Simotas. The initiation of this bill was prompted by a dangerous flash mob #Tide Pod Challenge: teenagers, mostly at the age of 13 to 19 years, swallow capsules for washing on a dispute throughout the country, then publicly transfer the right to experiment to the next “daredevil” – a friend, acquaintance and etc. Eating capsules is removed on the camera and laid out in social networks. The result is sad: most “experimenters” get to the hospital with severe poisoning. In January 2018, the American Association of Poison Control Centers reported “increased anxiety” due to the popularity of the Challenge. Since the beginning of the year 86 people have been hospitalized with poisoning with cleaning agents. In addition, hotlines of the association received more than 50 thousand calls related to eating or trying to eat washing capsules. And, horrible, hundreds of cases concern children under the age of 5 years. 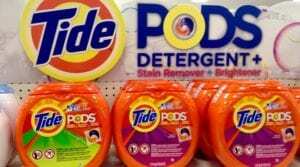 On February 6, Hoylman and Simotas said that they sent a letter to the parent company Tide – Procter & Gamble, calling for a new, less attractive design for washing capsules. In addition to the “neutral color”, the cleanser should have a bitter taste and be devoid of the frankly pleasant smell that attracts children, the letter says.